15. Runs the last command again !! 16. Hold option and click a position in the current line to move your cursor to that position. Did you know there is an option in Facebook to enable secured browsing..? Go to Account --> Account Settings --> Account Security and enable HTTPS browsing for your account as shown below. I am bit surprised though why this isn't enabled by default. There were many incidents reported where the Facebook sessions were hijacked - using Firesheep - a Firefox add-on. GnuPG is the GNU project's complete and free implementation of the OpenPGP standard as defined by RFC4880 . GnuPG allows to encrypt and sign your data and communication, features a versatile key management system as well as access modules for all kinds of public key directories. 5. Encrypting a document - you need to import the public key corresponding to the uid-of-recipient first in to your keyring as per step - 4. 8. Verifying a signature [detached signature] - you need to have the public key of the person who signed it in your keyring - see step-4. 10. Uploading your public key to a key server. 11. Download a key from a key server. Properties are name value pairs. Properties are a way to convey information across different processing units. For example user may need to set a transport property from the message mediation. Or user may need to remove a property which is set by the transport. This mediator sets or removes properties for a particular message. Property mediator has no direct impact on the message but rather on the message context flowing through Synapse. The properties set on a message can be later retrieved through the synapse:get-property(prop-name) XPath extension function. If a scope is specified for a property, the property could be set as a transport header property or an (underlying) Axis2 message context property, or as a Axis2 client option. If a scope is not specified, it will default to the Synapse message context scope. Using the property element with action specified as "remove" you can remove any existing message context properties. This blog post focuses on different types of scopes available while setting properties. Once you set a property under this scope - the value of it will be available through out both the in/out sequences. // Available only in the sequence the property is defined. This is similar to Synapse scope. The difference is - you can access it in following two ways..
Once you set a property under this scope - it will be added to the transport header of the out going message from the ESB. I couldn't find this in the ESB property documentation - so thought of keeping a note here. Also - there is a chance that you can confuse the constant "HTTP_METHOD" with org.apache.axis2.transport.http.HTTPConstants.HTTP_METHOD - which internally refers to ""HTTP_METHOD_OBJECT""
The goal of RPC in general is make distributed programming as easy as possible by creating the illusion that an exchange of data over the network that results in some processing (on another machine than the one the application is running on) is nothing more than a special kind of procedure call — one that has the special attribute of being “remote”. Unsurprisingly, RPC is the foundation of client/server computing. While RPC started out as a way to provide a transparent programming experience for traditional, procedural models, it was quickly followed by technologies that aimed to do the same for object-oriented programming. Examples include DCOM, CORBA, and RMI. 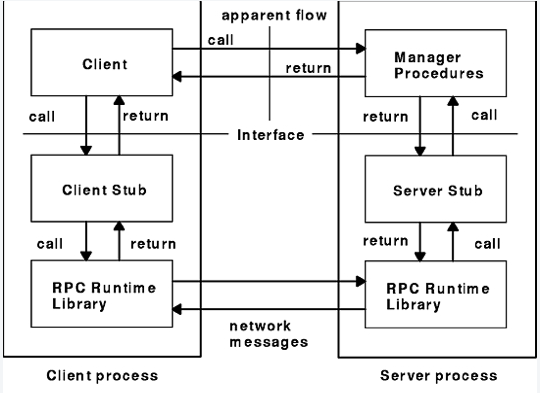 The first popular RPC solution was introduced by Sun (Sun RPC, later called ONC RPC) together with NFS, the Network File System. It featured all the important parts of more modern incarnations: An interface description with an associated stub/skeleton generator, marshaling, even a (albeit very simple) registry (portmap). The other important RPC standard is DCE RPC, which is also used as the foundation of Microsoft’s DCOM. The Sun RPC compiler is called rpcgen. As input, it takes a list of remote procedures (interfaces) defined in an interface definition language (IDL). 1. Server code: Main function that sets up a socket, registers the port with a name server, listens for and accepts connections, receives messages, unmarshals parameters, calls the user-written server function, marshals the return value, and sends back a network message. 2. Client stub: The code with the interface of the remote function that marshals parameters, sends the message to the server, and unmarshals the return value. 4. Data conversion functions: A separate file may be generated if special functions need to be called to convert between local data types and their marshaled forms. The rpcgen tool generates code in C - from a given IDL. Netbula JRPC is a complete port of the C version of ONC RPC to the Java(tm) platform - which generates code in JAVA. In this blog post we'll be using Netbula JRPC. Also Distinct ONC RPC/XDR for Java - is another vendor who provides an ONC RPC toolkit in java. Let's first have a look at how a sample IDL file looks like. Then the program block - a given program block can have different versions of the same interface - and program has a program number to identify it uniquely. In the following example, the program number is 1234567. Now let's have a look at the version block. As I mentioned before there can be multiple version blocks inside a given program and each version is identified by the version number. In the following example - the version number is - 1. Next the procedure list. Inside a one version - there can be set of procedures defined. And there also each procedure is identified with a unique number. In the following example sendmsg() is identified by number - 2 and addperson() is identified by number - 3. Each remote procedure call message contains the following unsigned integer fields to uniquely identify the remote procedure. The RPC protocol for a reply message varies depending on whether the call message is accepted or rejected by the network server. The reply message to a request contains information to distinguish the following conditions. - RPC executed the call message successfully. - The remote implementation of RPC is not protocol version 2. The lowest and highest supported RPC version numbers are returned. - The remote program is not available on the remote system. - The remote program does not support the requested version number. The lowest and highest supported remote program version numbers are returned. - The requested procedure number does not exist. This is usually a caller-side protocol or programming error. Let's get our hands dirty.. Following is the complete IDL of our example used here - which is in the file msg.x. Now, you need to download Netbula JRPC from here. You can find the jrpcgen tool inside the bin folder. Let's use jrpcgen to generate Java code. 1. msgserv.java : The RPC program interface definition, including constant definition such as program number. 2. msgserv_cln.java : The client stub class. This class implements the RPC interface defined above. An RPC client program instantiate an instance of this class and call its methods (remote call). 3. msgserv_svcb.java : The RPC service. This class inherits the RPC interface and is abstract, the programmer needs to extend this class and supply the implmentation for the interface. 4. person.java : The corresponding Java file for the struct person. Compile all four java files - make sure you have orpc.jar in the classpath. You can find orpc.jar inside the lib directory of Netbula distribution you downloaded. Next let's write the actual service and start it. Following is the code for it - msgsvc.java. Now compile and start the server - msgsvc.java. Next the client... Following is the code for client. Here, we constructed the client which connects to the server on host args with UDP protocol, send a message, and print out the reply. If you get here - means your sample works fine.. :-) Let's get in to the internals. You may recall - that I mentioned jrpcgen produces four java classes. One of them is the interface, msgserv.java - which is been implemented by both the client and server side stubs. Let's have a look at this interface. Can you notice that this defined four constants. _def_pno is the program number. _def_vno version number of the interface. Other two are the numbers corresponding to each procedure defined in the IDL. Now let's have a look at the constructor of the client side stub, instantiated by our ClientTest.java above. @param proto protocol, can be "tcp", "udp" or "http"
See here in this constructor it passes the program number[_def_pno] and the version number[_def_vno] to construct the instance. So - this particular instance is created for a given version of the given program. Now you got a very valid question. What if we have multiple versions inside the same program. How does this constructor look like. Well.. in case we have multiple versions - then for each version separate client/server stubs as well as an interface will be generated. Similarly if you look at the sendmessage() method of client side stub, you will find out - the procedure number is used to invoke the method. The above emphasizes on the value of having program number, version number and procedure numbers in RPC. Still not happy? Then let's have a look at the server side stub. Here, this the method invoked at the server side when a service method been invoked from the client end. Here you will see - based on the procedure number, procedure been invoked. This post explains how to add custom HTTP headers to a web service request initiated from an Axis2 client. You may also have a look at this blog post by Keith, which explains how to add custom HTTP header to a response message from Axis2 service end. The default password is wso2carbon. You can put any name to alias [e.g. myservice] and need to replace public_cert.crt with name of the certificate you have from . 3.You may be using an IP address as the web service end point or the CN of the certificate issued for the end point may not match its server url. This could cause a host name verification error. To overcome that, find the following in [ESB_HOME]/repository/conf/axis2.xml ..
4. If the Web Service or it's WSLD - or the both enabled for mutual authentication - you need export the public certificate of WSO2 ESB out and import it to the trust store of the Web Service. To export out the ESB public certificate you can use the following. You can find wso2carbon.jks at [ESB_HOM]/resources/security/wso2carbon.jks and it default password is wso2carbon. Class loading is widely viewed as one of the darkest arts in Java development. In this session, Jason Greene will provide insight into the how and why of Java SE, Java EE, JBoss Application Server, JBoss Microcontainer, and OSGi class loading. He will offer historical perspective by beginning with JDK internals and progress to the modern, modular class loader models in use today. In addition, Jason will cover common pitfalls and methodologies to avoid them. The Zen of Class Loading from JBoss Developer on Vimeo. - Essay like content doesn't help. Make the content as short as possible. - One image worths thousand words - use images whenever appropriate. - Use syntax-highlighters whenever you publish code. 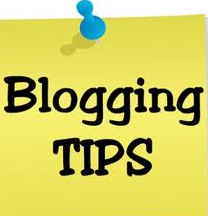 - Use proper tags to tag your blog posts. 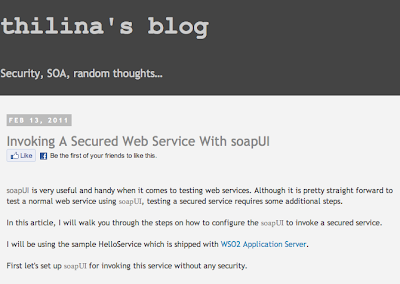 - Don't make the blog looks crowded with too many widgets/gadgets. - Always blog with a human name. That will give the readers' the feeling of being real. - DZone is a technology publishing company that produces valuable content for software architects and developers worldwide. - It has a considerable amount of user base, highly focused on technology related topics. - Do not publish your links on Weekends. - Make the DZone link description meaningful/attractive and readable. - Reddit is a social news website which has wide variety of topics. - Pick the most appropriate topic for your link. - Reddit has a huge user base compared to DZone. - Tweet about your blog post. - Publish first in DZone and then Tweet the DZone link. - Use catching words to describe what you have in the blog post - it need to not be the title always. - Don't publish the entire blog post to feeds. Blogger has an option to limit number of words.